For those who just can’t leave their cars stock standard the way it rolled out of the showroom, BMW has unveiled a range of BMW M Performance accessories for the new F16 BMW X6. Exterior body parts consist of a carbon front splitter, rear diffuser and rear spoiler, as well as rear fins and rear side flaps in high-gloss black. Hand-built carbon BMW M Performance exterior mirror caps and a black treatment for the kidney grilles complete the visual makeover. There’s also a choice of four 21-inch bi-colour light-alloy wheel designs with runflat tyres. The wheels are 1.5 kg lighter than comparable standard light-alloy items. For those who want a sportier sound, there’s the BMW M Performance silencer system made of stainless steel, which comes with two chromed trapezoidal tailpipes. There’s even an M Performance key case available. 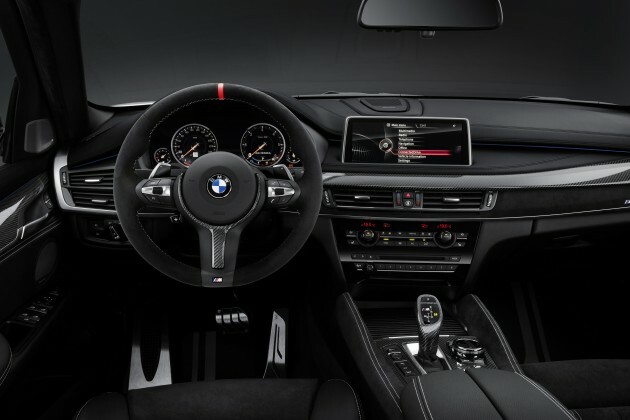 Interior options include brushed stainless steel door sill plates with battery-powered (no wiring needed) illuminated BMW M Performance lettering and carbon interior trim strips. Also offered are a carbon gear lever with a BMW M logo, an Alcantara BMW M Performance steering wheel, BMW M Performance stainless steel pedal covers and BMW M Performance floor mats. If you’re not really into looks, you can opt for the Power Kits. The Power Kit for the BMW X6 xDrive30d takes power up from 258 hp and 560 Nm to 277 hp and 585 Nm. This shaves 0.2 seconds off the 100 km/h sprint time, now down to 6.5 seconds. For those who opted for the petrol BMW X6 xDrive35i, power can be upped from 306 hp and 400 Nm to 326 hp and 450 Nm – improving the 0-100 km/h sprint by 0.5 seconds to dip just under six seconds. These Power Kits consist of a new control unit with revised engine data and additional hardware components, such as an upgraded intercooler and larger 18-inch front brake discs. 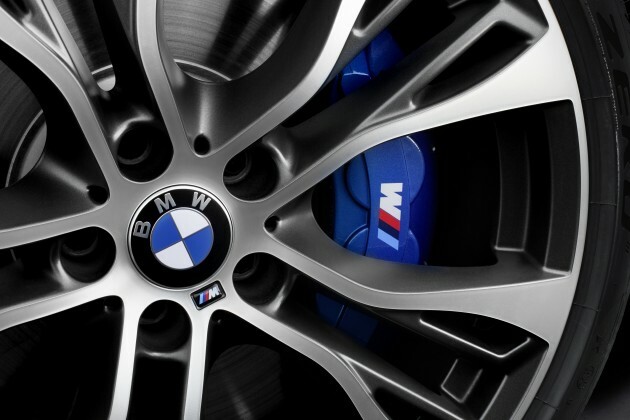 For even more stopping power, there’s the BMW M Performance sport brake retrofit kit with larger 19-inch lightweight brake discs. Finally, there’s the BMW M Performance Drive Analyser which allows owners to examine their driving style. It consists of an On-Board Diagnostic (OBD) stick, which is plugged into the relevant socket in the car, as well as software in the form of an app for Android and iOS smartphones and tablets. The connection between the car and OBD stick is via Bluetooth. Agreed but those power kits are gimmicks…they could have just installed it in the first place since the upgrade in performance is marginal. Its a different story if the kit shaves a whole second off the 0-100 mark and top speed increases by 20kmh. The sport rims, are gorgeous !! And some people will say this car is ugly. Ok, everyone have different eye and brain. Love those trims but that car is….I don’t want to say about it. I prefer the Old one coz more sporty than new body..